The Grade Dating App claims to eliminate unfriendly online dating users. 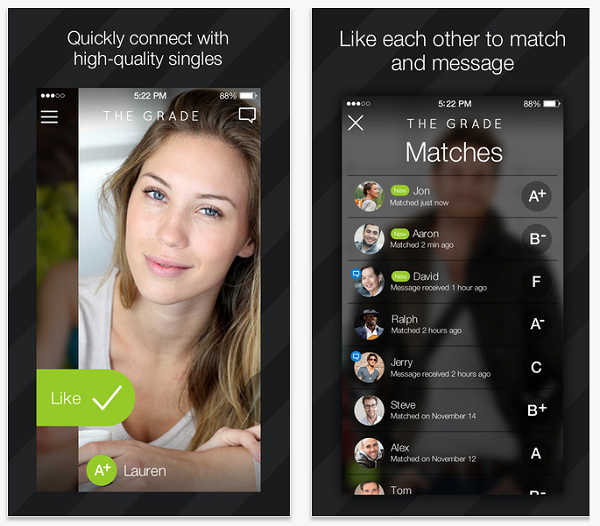 Thegradedating.com have developed a dating app, for Android and iPhone, which relays on a user score system where each member gets his own grade and is shown in the app accordingly. If your grade is low enough you get booted out of the app completely. 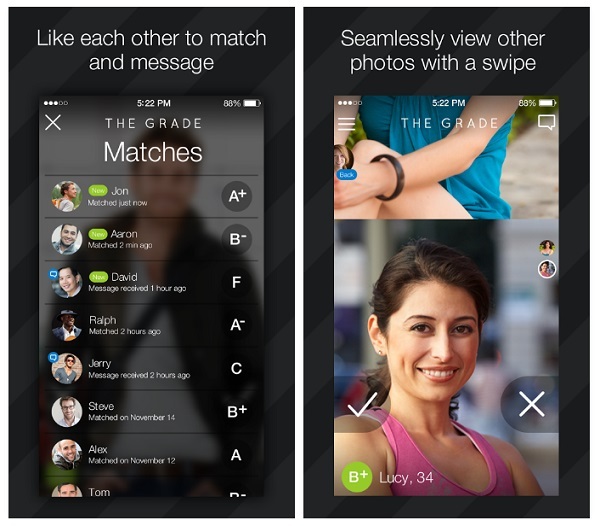 The Grade App changes many aspects of traditional dating sites with its grading system. It creates a singles dating community which is honest and safer for women and men. The Grade Dating gives honesty the edge, and if you’re looking to find a relationship, love, or romance online you should definitely download the free Grade Dating App to your mobile or tablet. 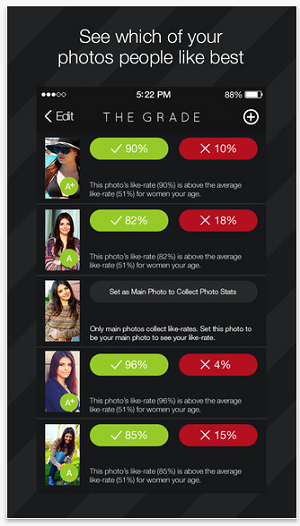 The unique online dating feature of the The Grade Dating App is its grading algorithm which allows mobile phones and tablet users of Android and iPhone to receive a grade score from A+ to F. Members of this singles dating app with an A+ grade get more exposure, making it easier for them to find local singles, while members with an F grade get booted out of the application. 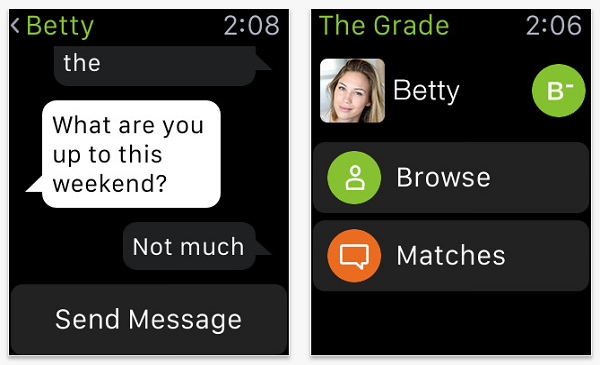 The Grade App greatest advantage for both Android and iPhone users is the grading algorithm which turns the dating app into an honest venue to connect singles who are active, responsive, and keep an updated profile. If honesty, responsiveness, and pro-activeness are important in your love life then The Grade Dating App will make it easy to find a romantic match through your mobile. 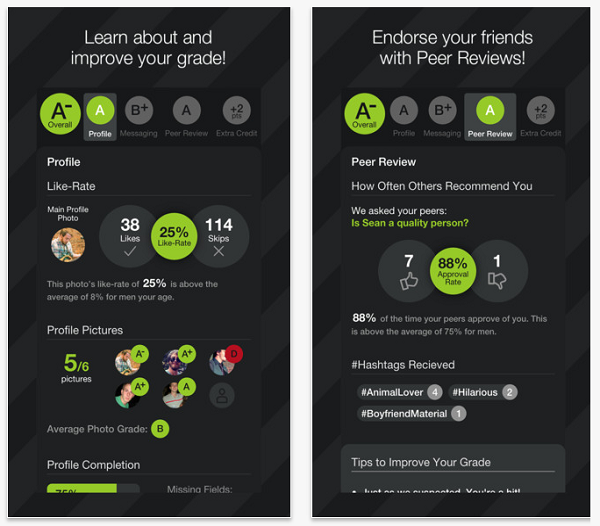 The Grade users get a profile grade, messaging grade and peer review grade. The system takes all of these into account when giving a member its final grade. Note – if this app isn’t what you were looking for be sure to check out additional Android dating apps and iPhone dating apps we have reviewed (and which you can download here). Currently there is no The Grade Mobile site available from which you can sign up and register. The Grade Dating App is only available for download for Android and iPhone mobile devices and tablets through Google Play and the App Store. It is kind of a shame because making Thegradedating.com have a login option which will enable other mobile users such as: Blackberry, Windows Phone and others to access the site and use all the features of the Grade mobile dating app would be a great service to offer. Receive your grade score from the system algorithm. Mutual likes open up conversation and messaging. Creating and updating your profile. Get notifications to your inbox. People who have an iPhone or Android The Grade Dating App is what they should download and install if they wish to meet an honest match. This dating app offers much more honesty, and filtering for singles who are looking to date online and do it through their mobile. 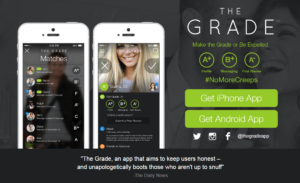 The Grade App is free to use and serves a growing singles dating community which is looking to cut through the nonsense and abuse found on other dating sites and apps. The app is safe, stable and fun, with a good design and intuitive navigation. This singles dating app is perfect for anyone who’s looking to get into a serious relationship, find love, or just to enjoy dating online in safety. 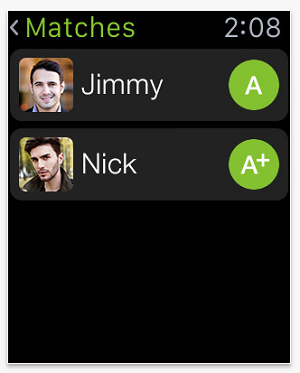 We highly recommend you download The Grade Dating App to your iPhone or Android, it’ll be worth your time. Publisher: SNAP Interactive, Inc.© 2016 SNAP Interactive, Inc.
Must I have a Facebook account to register to The Grade Dating App? Yes. This is just another way to authenticate the users identity on the app. Can an F grade be changed?